Female Balance is a supplemental herbal formula that is indicated and marketed for menopausal women and the relief of mood swings associated with menopause, as well as other typical complications or discomforts that are often associated with menopause. The formula, which comes from Kroeger Herbs, is formulated as an herbal supplement that works through balancing the electromagnetic balance of menopausal women. Black Cohosh root- Black Cohosh has been used for the treatment of menopausal symptoms. Anise seed- Anise Seed is used to treat Menstrual discomfort. Yellow Dock root- This root has insufficient evidence showing that it can help with Bacterial infections. Ginger root- Ginger Root can help with some Menstrual pain. 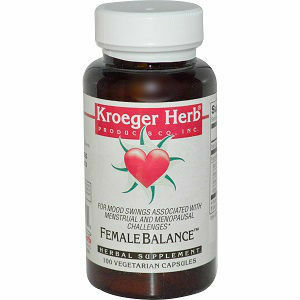 Female Balance has a recommended dosage of 2 capsules per day. These should be taken between meals. The price of one bottle of Female Balance is $7.68, normally they would cost $12. 99, this means you save 40%. Each bottle contains 100 capsules. Female Balance comes with a 5-star guarantee, however, Female Balance does not guarantee your money back, all they guarantee is your safety on their site and low prices. Female Balance does not provide any guarantee of any kind other than that your safety is guaranteed while using their site, and the guarantee of low prices. Kroeger Herbs has no intention of actually taking care of their consumers. Most of the ingredients found in the Female Balance Formula are beneficial in some way, though they are surely not proven to be effective for the relief of menopausal symptoms. Jackie Horowitz	reviewed Female Balance	on March 6th	 and gave it a rating of 2.